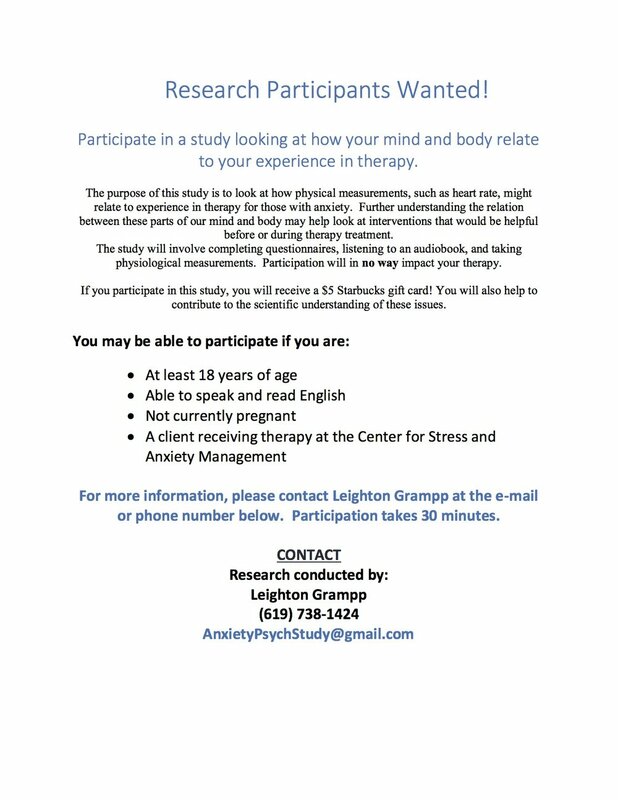 We are looking for volunteers to participate in a study looking at how your mind and body relate to your experience in therapy. The purpose of this study is to look at how physical measurements, such as heart rate, might relate to experience in therapy for those with anxiety. Further understanding the relation between these parts of our mind and body may help look at interventions that would be helpful before or during therapy treatment. The study will involve completing questionnaires, listening to an audiobook, and taking physiological measurements prior to your first therapy appointment. Participation will in no way impact your therapy. If you participate in this study, you will receive a $5 Starbucks gift card! You will also help to contribute to the scientific understanding of these issues. For more information, please contact Leighton Grampp at the e-mail or phone number below. Participation takes 30 minutes. Do you find yourself washing your hands, checking locks, or thinking certain thoughts over and over? You could qualify for a study on how the brain processes information. *Receive $25 compensation and a summary report of cognitive and clinical findings. • Visit www.surveymonkey.com/s/OCDASD for details and an online screen. We are looking for volunteers, ages 12 to 17, to complete 1 hour of psychological testing for a doctoral dissertation study through Alliant International University. Testing procedures will include performance-based measures involving personality and emotion, in addition to questionnaires related to unusual experiences and beliefs. Data will be used to help create a new measurement tool to increase the accuracy of predicting certain psychiatric symptoms in adolescents. For completing the full study, participants will receive $40 to be given to parents or guardians. If interested, please call or text Melissa Rosenberg, M.A. at 201-280- 3474 or email at mrosenberg@alliant.edu.